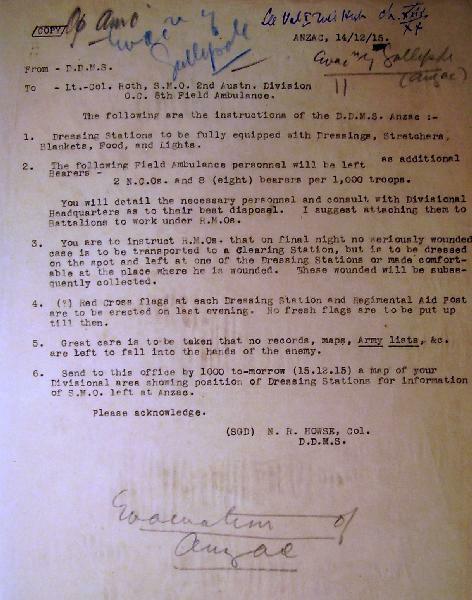 Below is a letter sent by Colonel Neville Reginald Howse (later Major General) giving instructions to Lieutenant Colonel Reuter Emerich Roth, the Officer Commanding 5th Field Ambulance about medical arrangements for the evacuation of Anzac and Suvla scheduled to take place over the nights of 19 and 20 December 1915. The arrangements are brief and the detail is in what was left out rather than included with the care of the non-walking wounded. The instructions indicated that medical facilities would be pared down to the minimum. The prayer was that the Turks would not attack during the evacuation as there were no facilities to care for mass casualties. One other unstated item related to the stretcher wounded - there was a commitment to evacuate these men if possible. The comment: "These wounded will be subsequently collected." is quite chilling and relied upon everything going smoothily and that they could be subsequently collected. The very nature of this order indicates that if things went wrong, the stretcher cases would be abandoned. The orders give no commitment to evacuate the stretcher cases unless able to be collected subsequent to the availability of stretcher bearers who were to be very thin on the ground. Luckily for everyon concerned, the stretcher bearers were not required and no one was left behind. 1. Dressing Stations to be fully equipped with Dressings, Stretchers, Blankets, Food, and Lights. 2. The following Field Ambulance personnel will in left as additional Bearers - 2 N.C.Os. and 8 (eight) bearers per 1,000 troops. You will detail the necessary personnel and consult with Divisional Headquarters as to their best disposal. I suggest attaching them to Battalions to work under R.M.Os. 3. You are to instruct R.M.O. 's that on final night no seriously wounded case is to be transported to a Clearing Station, but, is to be dressed on the spot and left at one of the Dressing Stations or made comfortable at the place where he is wounded. These wounded will be subsequently collected. 4. (?) Red Cross flags at each Dressing Station and Regimental Aid Post are to he erected on last evening. No fresh flags are to to put up till then. 5. Great care is to be taken that no records, maps, Army lists., &c. are left to fall into the hands of the enemy. 6. Send to this office by 1000 to-morrow (15.12.15) a map of your Divisional area showing position of Dressing Stations for information of S.M.O. left at Anzac. (SGD) N. R. HOWSE, Col.